Sandry, a noble whose parents died recently, has power with thread, from spinning and weaving to simple knot-tying. Daja, a Trader, is the only survivor of a shipwreck in which her family drowned. Declared to be bad luck and banned from life with other Traders, she is free to learn to work metals and, through metal, to work magic. Tris, the merchant's daughter, is no orphan, but her family doesn't want her. 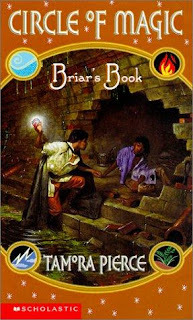 Briar is a street rat, a thief and convict. Only at the temple city of Winding Circle does he learn that his strange love of growing things is more than a need to garden. Brought together in a house inside the temple city's walls, watched over by the mages Lark, Rosethorn, Frostpine and Niko, the four struggle to be friends, to exercise their magic, and to survive. Each book centers on one of the four, but make no mistake: they are bound tightly together, and the events that affect each of them also strengthen their connections to one another. 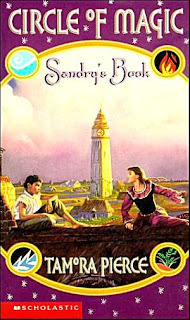 A really great young adult fantasy series. 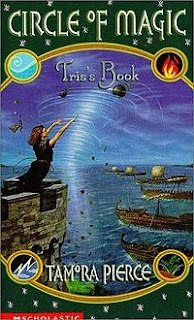 There are companion novels which expand upon the lives of these four mages, introducing new characters as well. 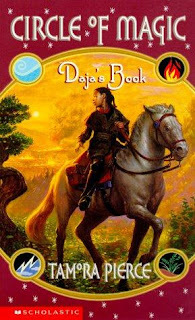 If you're interested in learning more visit Tamora Pierce's Website I recommend all of her books, especially for young girls, because many of her protagonists are strong female characters.